I design almost everything I make, but I don’t consider myself a designer. I am a maker. I design things, yes, but that’s not where it’s at for me. I like making things. I think this is a good way to work. A mediocre design can be made very palatable by good technical skill, but there’s no design so great that it wouldn’t be ruined by being poorly executed. Anyway, with all that in mind, I thought it would be interesting to post my initial sketch of an item (which is usually the entirety of the design), and then see how the final item differed. Here’s a picture of the initial sketch. I turned up the contrast to make it seem gritty and noir-esque. The first thing I realised was that I had drawn 6 straps, and NO ONE IS THAT TALL. That got cut down to three. The second thing that changed, which isn’t really obvious from the sketch, is that the buckles were originally going to be stitched onto the facing, but I decided to try and put them in the dart, instead, to avoid having a raw edge. It would also help support the weight of the buckles. I’m really pleased with how this worked- I think it looks really neat. As a result of that, the straps were extended so that they started in the other dart, rather than being attached to the edge of the right hand facing. Oh my. I have literally just this minute realised that there was a lapel in the drawing. I did NOT see that. I guess that’s number 3! The moving of the straps to the dart meant that I had to redesign the buttons- to be honest, even when I was drawing them, I had no intention of putting that many buttons on. Maybe six or seven, but twelve? Nope. At this point I decided to slightly change the line of the left front piece, so that the buttons could be equally spaced between and above the straps. I don’t know if this counts, because that was a fairly arbitrary line to start with. 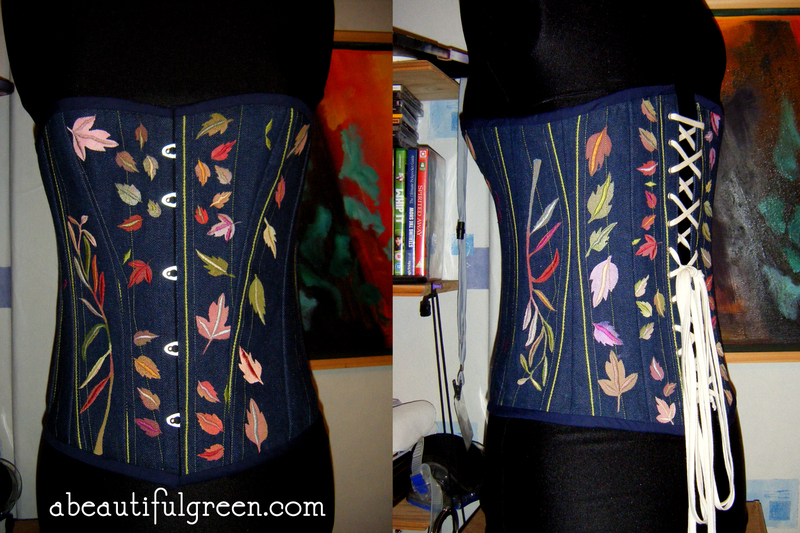 The lines under the buckles that fasten the straps coming down from the shoulders were going to be just embroidered. I took those out because I thought they’d spoil the line. Not because I forgot to put them in before I’d stitched the lining in… Not that at all. I also changed the strap fastening from buckles to buttons for a number of reasons; I have a lot of brass buttons, and far fewer buckles; Buckles are heavy, and in that position, would have sagged; it’s easier and neater to put buttonholes in tape than it is to put in eyelets, especially when you’re out of eyelets; that’s quite enough semicolons. I’ve also not added the second strap, but I might yet- it was designed to loop around the first, and I can still put more buttons on. I gave myself rather more space in the drawing than I had in actuality, though, so I might leave it as it is. Anyway, after all that, here’s a picture of the result! I’m pretty pleased with it! Workshopping names just now, and I’ll get some nice pictures of it tomorrow, at which point it will be listed! I’ve already sold one, too, so that’s nice! New Corsets, New Waistcoats, Knitting, Babies, and so on! You know that scene in the Matrix where Neo flips through his hollowed out book to find a particular illegal computer program? That’s how I feel when I flip through the box I keep my machine needles in. Gem number two: I was watching Up All Night the other day, and there was a baby in it, and I thought “Babies sure are cute. I wish some of my friends would have a baby so I could knit them something” and then I thought “One of your friends had a baby TWO DAYS AGO. You have had NINE MONTHS to prepare. WHAT IS WRONG WITH YOU?” Since then, I have been knitting a cute baby jersey, which there’s not much to see of at the moment, but I’ll post some pictures when it’s done. I can’t take credit for the pattern, though. We’ll be making these made to measure, for around £200 each. When the photoshoot’s been done, I’ll list them on my Etsy store, but in the meantime, if you’d like more information, head over to the contact page on the left there. 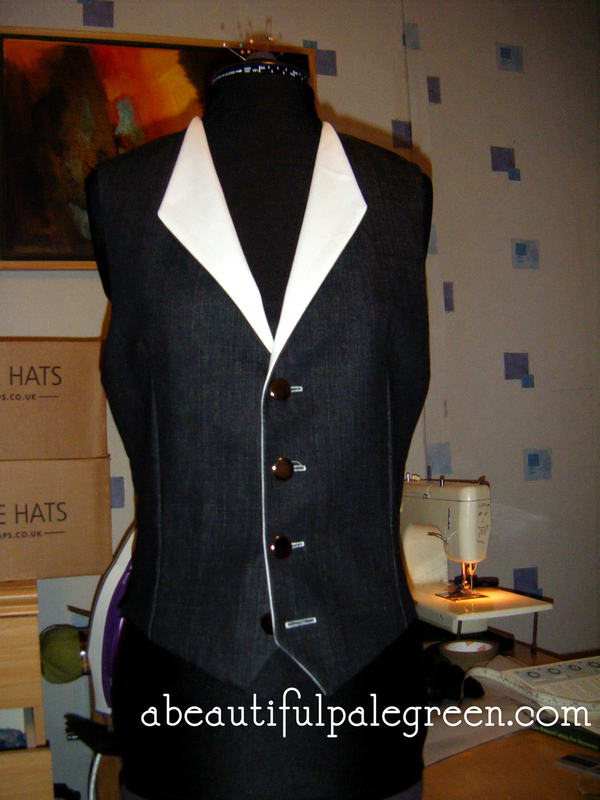 I’ve just finished up a waistcoat for a friend of mine. You can take a look at his blog- it’s mostly about gaming and modelling, but he’s also an architect and a handy graphic designer. He’s redesigning my site and graphics in exchange for clothing. 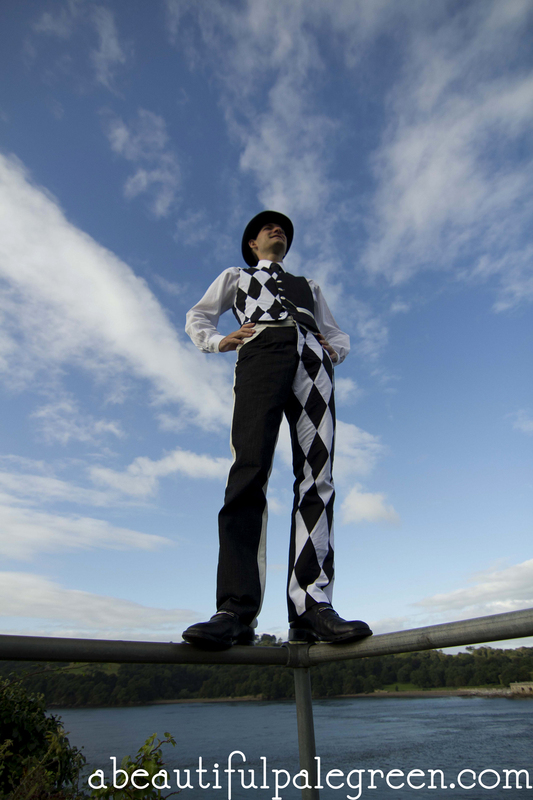 He asked for a waistcoat, and I thought this would be a good opportunity to launch a new design- he can have a nice new waistcoat, and model it for me, and I can have a new website, and some pictures! Modelling the waistcoat in this picture is Esmerelda, my female model, because Dagmar, my male model, is bigger than my friend. I’ll put up some pictures as soon as I see it on him, though! I’m very happy with the design- it’s a super clean line, which would look incredible with the right tie. I’ll be listing it made-to-measure on Etsy when I get some good pictures of it- in the meantime, if you have to have it, drop me a line! Some time ago, and it feels like a lot longer than it was, I discovered steampunk. It looked like fun, and I wanted to get involved, but there wasn’t very much going on outside of the US at the time. 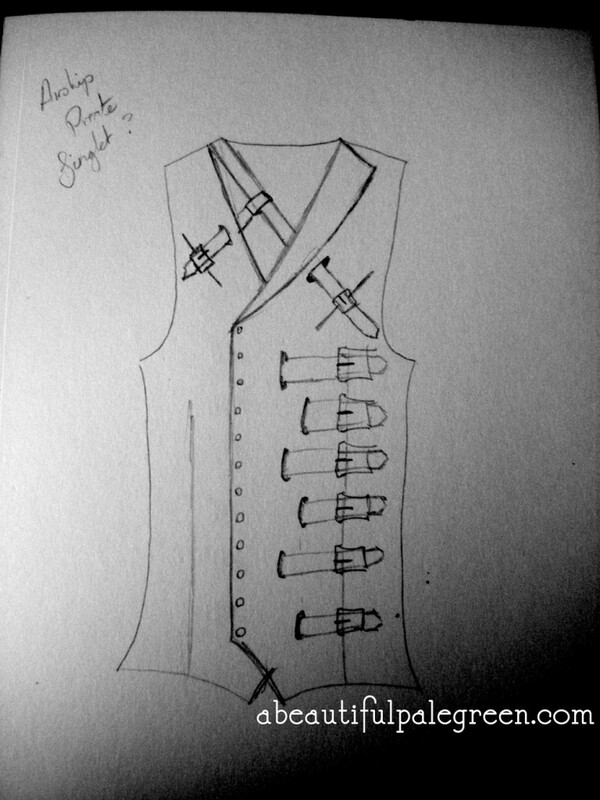 Now, with the Etsy shop open, and with me in a better place for making things, I have decided to make steampunk clothes. 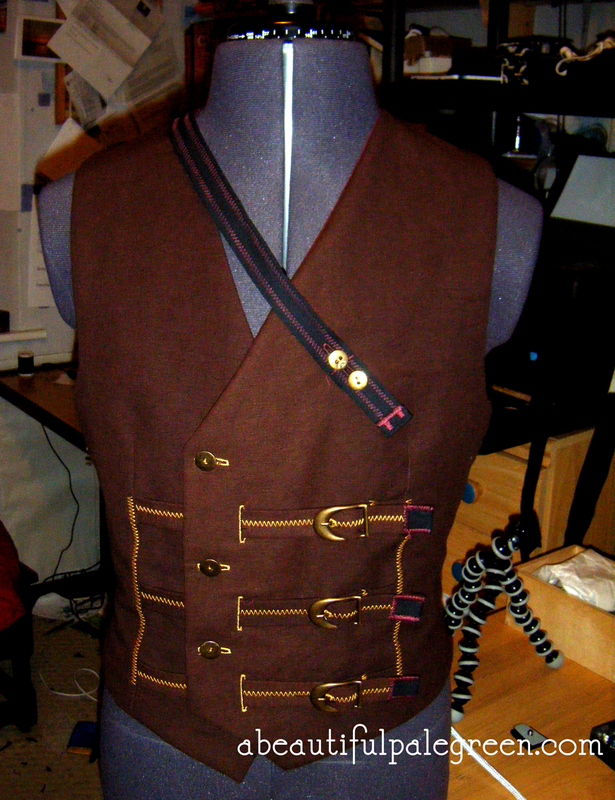 Making steampunk clothes is fun. I am making a waistcoat at the moment. 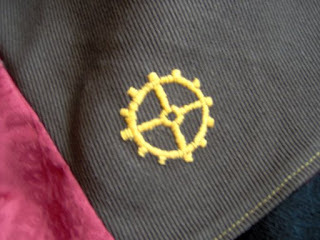 I always get a little bored sewing buttonholes, but then, what is steampunk about buttons? Let’s replace them with some nice brown leather straps. And wool, for a waistcoat? No, I much prefer canvas and other heavy fabrics. 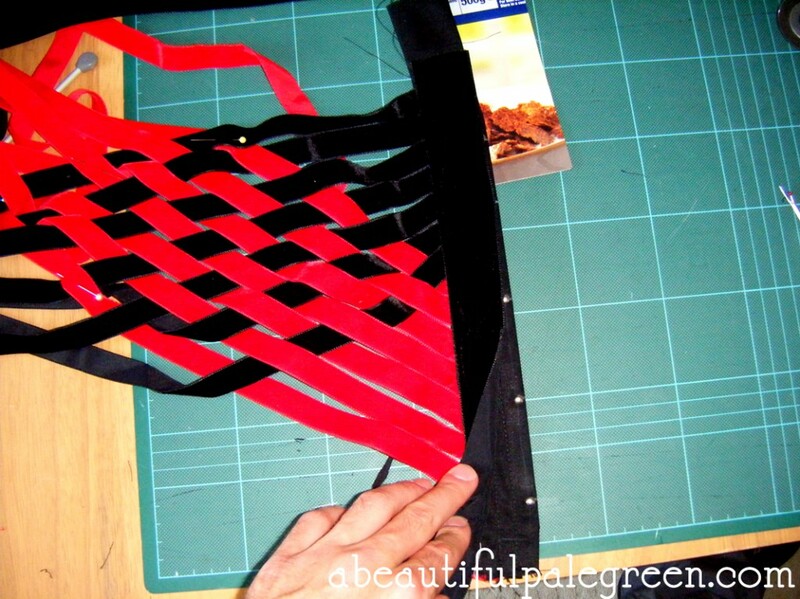 The embroidery is going to stretch all the way up the right hand side, with the straps and buckles taking up most of the left. I haven’t been this excited about something I have made since I knitted my first jersey!